Google has clearly started a series of Thanksgiving Day Google Logos celebrating Thanksgiving 2010. This series of Thanksgiving logos is a bit different, however, from the normal trend of Google logos that we’ve seen. Google is actually highlighting an individual who is not celebrating a birthday or an anniversary of some sort. Ina Garten is the chef, and her Thanksgiving Day recipes are the point of focus. And apparently Google is going to be highlighting one new recipe each day up to Thanksgiving which is now two days away. So we can probably expect a new logo tomorrow and Thursday morning, and then be back to normal Google logos on Friday. But then again, you never know with Google. And when you clicked the logo, you were taken to the first in the series of recipes called Perfect roast turkey with herb & apple stuffing. Today’s Google logo is obviously featuring the old time classic Thanksgiving favorite pumpkin pie. But as you can imagine, with Ina Garten, this is no ordinary pumpkin pie. 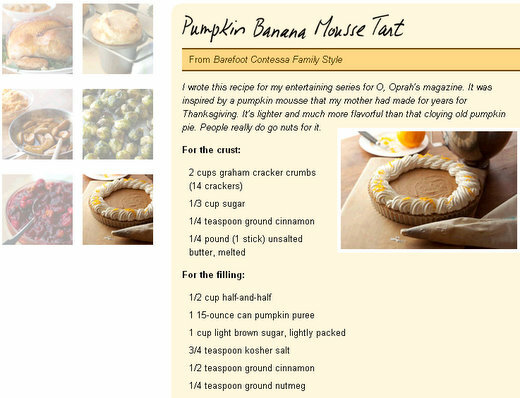 The recipe is for Pumpkin banana mousse tart. 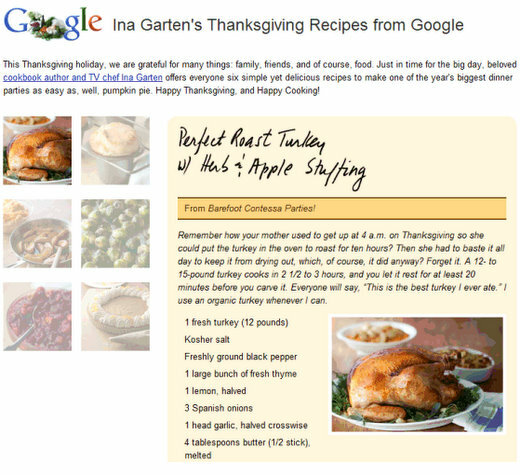 There are six recipes in all that are featured on the Ina Garten’s Google website, and you can check out all of her Thanksgiving Day recipes here. Just click any of the small thumbnail image in the top left of the page. I don’t even understand how I stopped up here, but I believed this post was once great. I don’t recognise who you might be however definitely you’re going to a well-known blogger in the event you aren’t already. Cheers!